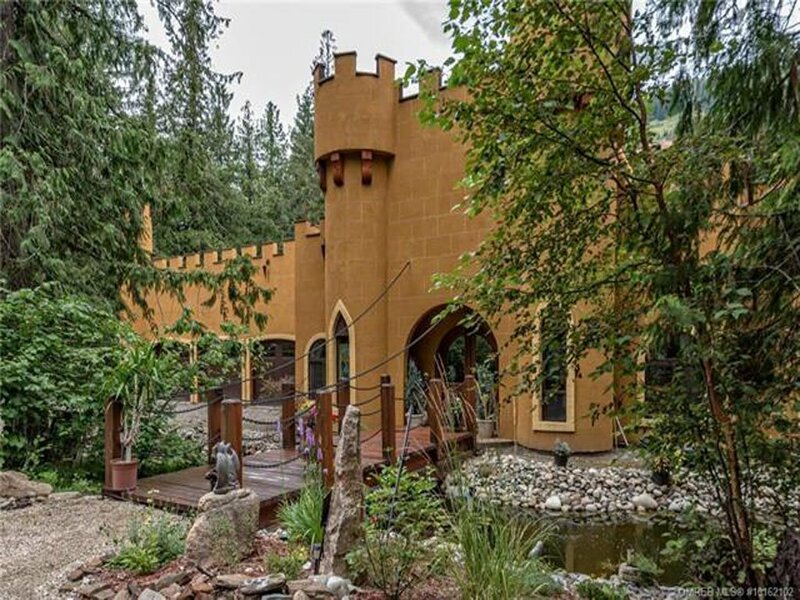 Get your own Castle-like home in the beautiful interior of British Columbia. This 8.8 acre oasis includes 612 feet of water frontage on Shuswap River and also almost 700 feet of frontage on Cherry Creek. This incredible property includes a private island in the middle of Shuswap River. Swim in the crystal clear, pool-like eddies, walk through forest trails, or even take a zip-line to the island. The stunning 3124 square foot faux castle main home includes reinforced rooftop entertainment area that can hold 300 guests, complete with kitchen, bar, BBQ and covered gazebo. Inside the home are gorgeous, large rooms with high ceilings throughout, beautiful kitchen, huge ensuites, walk-in closets & even a suite. Attached triple garage plus separate huge covered parking/storage & lots of RV parking. Complete with a bridge and moat, stocked with goldfish. You truly can be the king of your castle! The separate second residence features a lovely 2 bed 1 bath home, privately situated, which could be for a family member or caretaker. No effort has been spared to create this truly one of a kind riverfront property that must be seen to appreciated. Located only 15 minutes away from pristine Sugar Lake, for camping, boating, swimming or fishing. For more details, please visit Bennetto and Associates.